Today I’m sharing the last part of my Christmas Home Tour, as part of the 2nd annual Decked + Styled Christmas Home Tour! If you’re stopping in from Z Design At Home, welcome! Bree is the mastermind of the tour and collected a group of some of my favorite bloggers for this tour. She is also a dear friend and one of the sweetest gals I know! 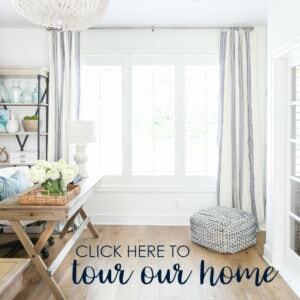 Each and every home on the tour is one I drool over on a daily basis when I see them on Instagram! 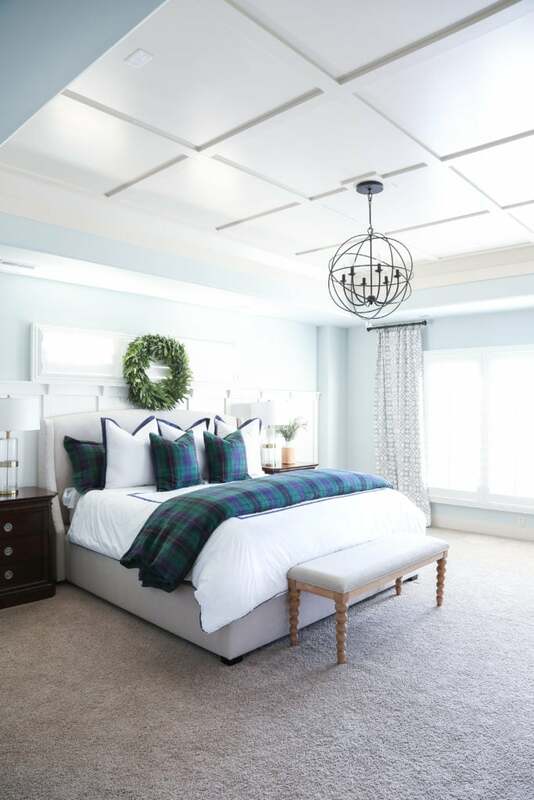 Last week, I shared Part I and Part II of our Christmas home tour, and today I’ll be sharing the final few spaces: our master bedroom and our recently updated craft room. Let’s move on to today’s tour! This year, I am all about simplicity with my holiday decorating. I’m in the middle of two major room makeovers, so I wasn’t nearly as eager this year to drag out boxes and boxes of decor. Instead, I made some easy, simple updates to our current decor to make it feel fresh and festive for the holidays! A week or two back, Williams Sonoma Home offered to send me some items from their Christmas line. 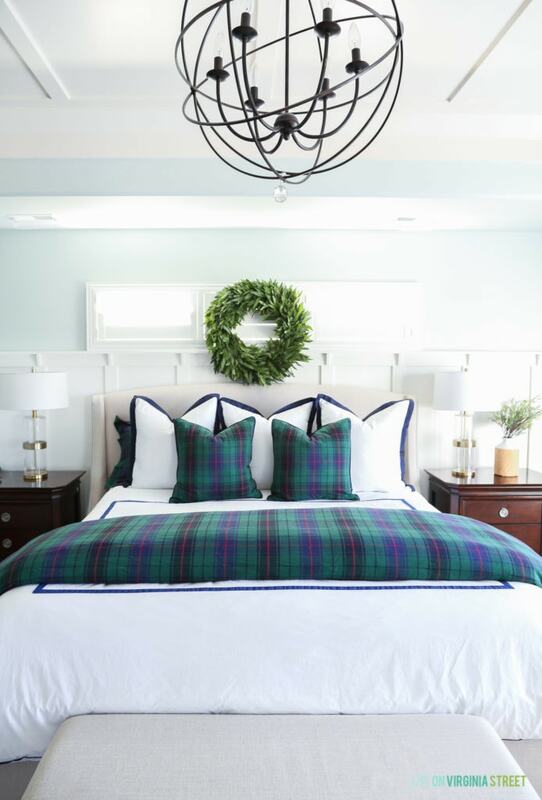 I basically geeked out a little before picking this gorgeous plaid bedding, pillows and bay leaf wreath. They’re the perfect classic Christmas touches! I’m planning to paint the walls this winter. I love the Sherwin Williams Sea Salt color, but I’ve decided as much as I love blue and green tones, I don’t love them on the walls in our home. I’ll also be painting the board and batten ceiling to a true white, rather than the almond color it currently is. 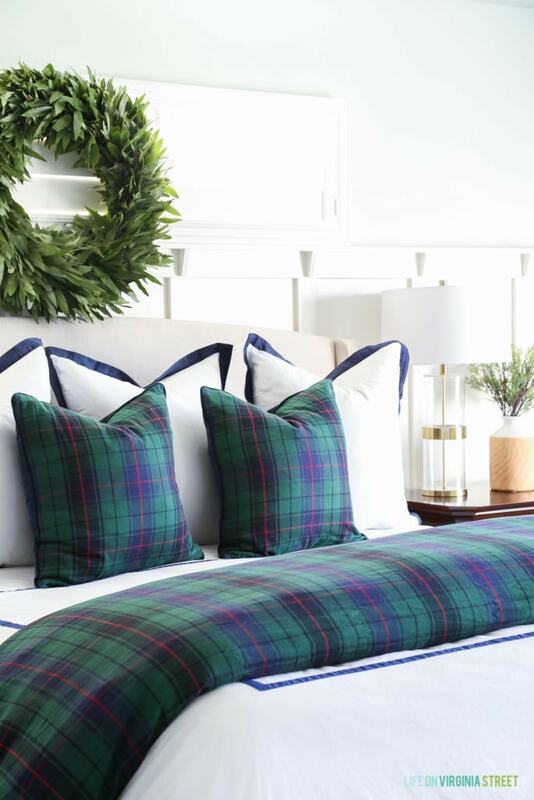 The bedding just makes the perfect, classic statement for Christmas. And the wreath makes our room smell like a spa! Interesting fact. The wreath will dry out in 1-2 weeks and we can use it for cooking after that point! But, I’ll likely try and save it for future Christmases! You may have also noticed that the spindle bench finally found it’s home in our bedroom! No more dark and clunky leather bench that we’d had in our room for nearly seven years. Moving over to our craft room, I honestly didn’t do anything to update it for the holidays other than add this fresh bay leaf garland. But, since I haven’t ever shown the room since I added the daybed, I thought this would be a good time to show it as well. This is basically where I store all my home decor, craft supplies, sewing machine, etc. But, it also doubles as my TV room and workout room so it has a lot of functions! Since Kurtis never goes in the room, I decorated it how I wanted really without any input from him. 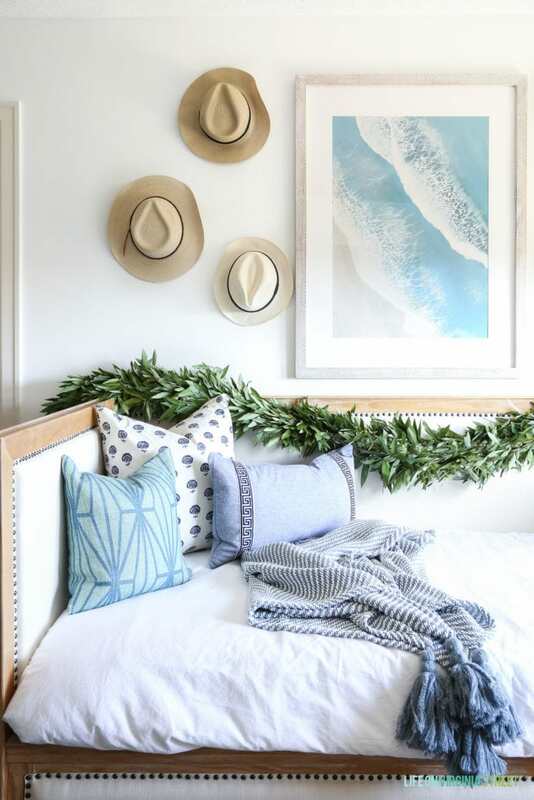 I am obsessed with this beach artwork I received from Minted, and I added some vacation hats on the wall around it. I love that each and every hat reminds me of a particular vacation, and I figured this was a fun way to store them and add some texture and visual interest to the space! 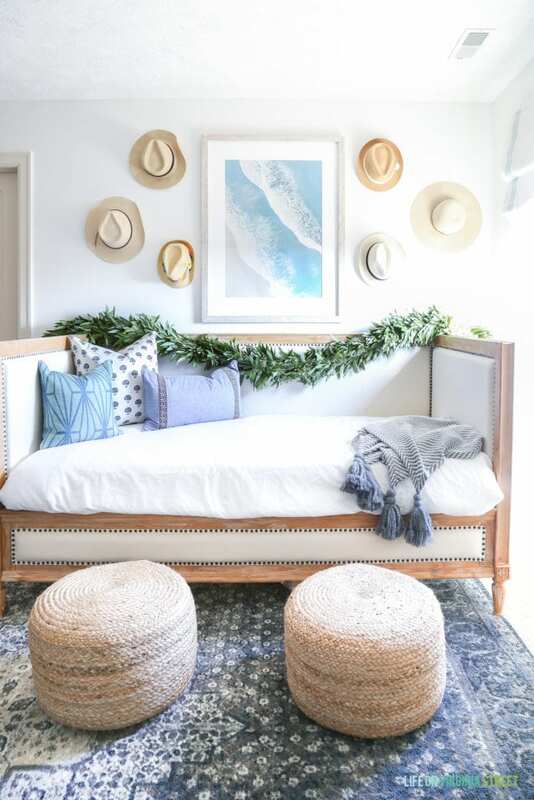 The bay leaf garland smells heavenly and adds a festive touch to this coastal space! We’re still obsessed with our TV that looks like art! I actually get frequent questions about it so I thought it was worth mentioning again. It really is amazing! I still can’t get enough of the scallop light fixture – and we now have it in two spaces in our home! We love it that much! You can see it in our buffalo check laundry room here. 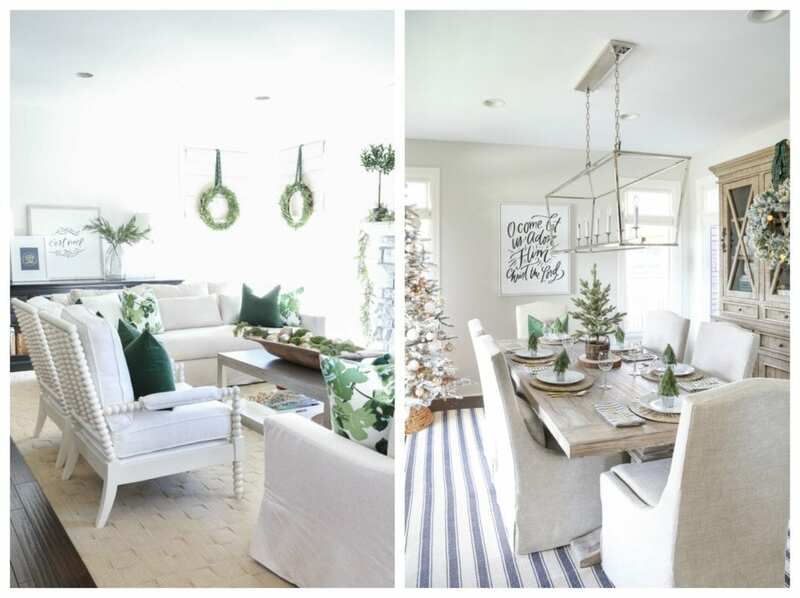 I hope you enjoyed this last installment of our Christmas home tour! Be sure to also check out our Christmas living room and dining room. 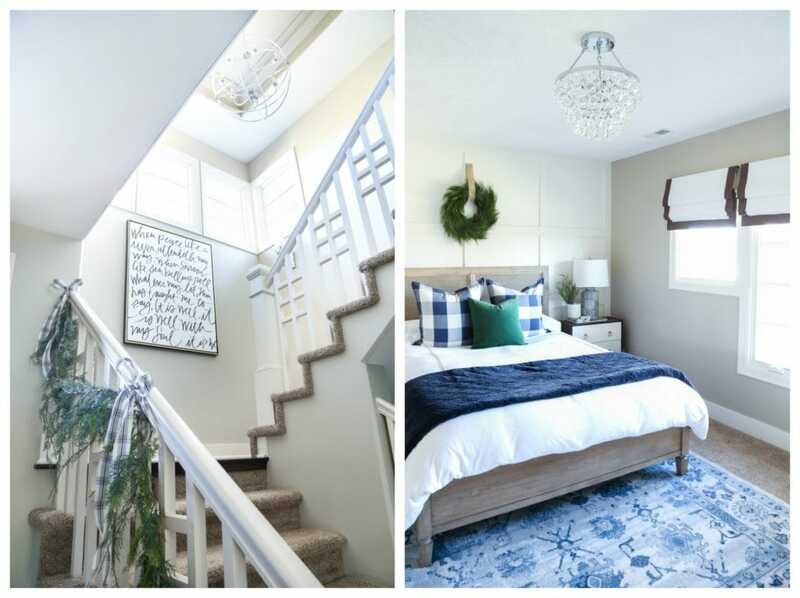 And in case you missed our Christmas entryway and guest bedroom, you’ll also want to check those out! The next stop on the tour is Sunny Side Up. 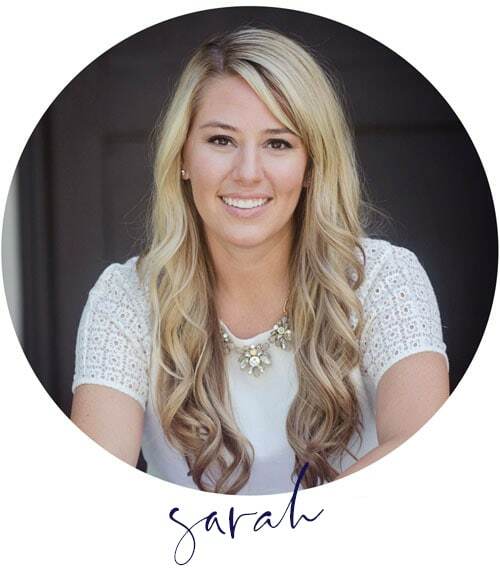 I not only love Erin as a person, but her style is so good and she lives in my dream home in Southern California! Simple but really nice…Love it! The craft room update looks good. Excellent choice on the day bed. The whole house looks gorgeous! These are so pretty!! I love how fresh and clean the “Holiday Greenery” looks. Merry Christmas to y’all!! 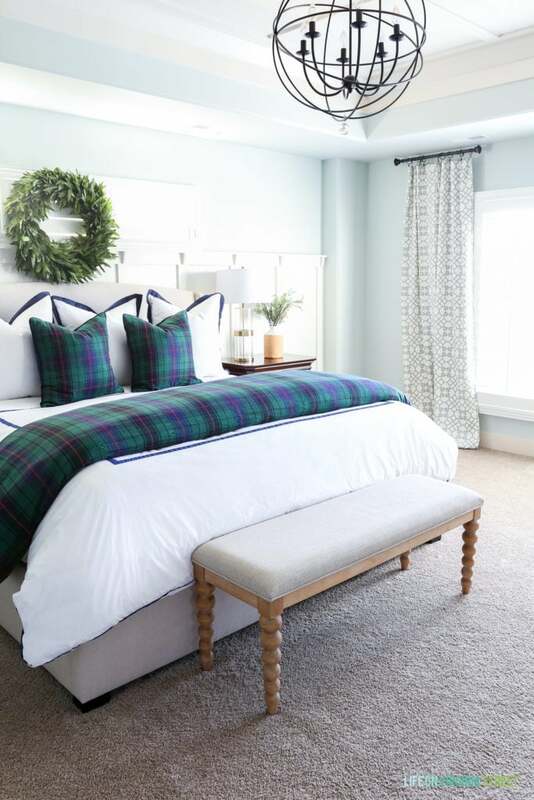 Sarah, 1. your new WS bedding is to die for and that wreath! What a perfect story to make such a great gift! 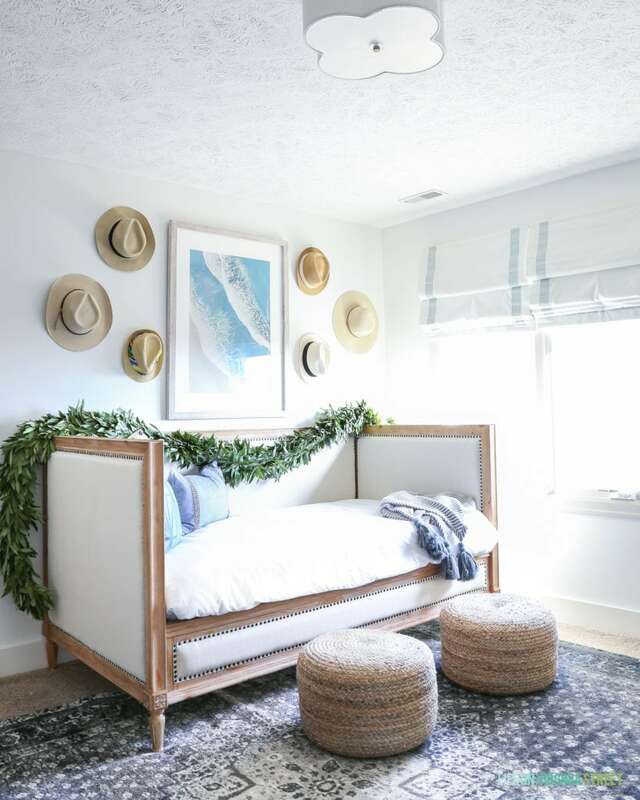 Also, I think your daybed should have garland year-round because it looks INCREDIBLE! Your Home looks so pretty and festive! I especially love the garland touch on your daybed. What a great idea! I definitely need to get one of those TVs that look like art too. We have our tv hanging above our fireplace right now and I sometimes wish it was just art up there!